The Blairs collected prairie styled art glass light fixtures and dining room chairs from the demolished Yellowstone Canyon Hotel. One of the double stained glass light fixtures is mounted on a stone pedestal in the front yard and the second is on a pedestal in the Garden Court. A smaller set of single stained glass wall mounted light fixtures are mounted on either side of the entrance to the Blair’s Holiday Inn in Cody Wyoming. The Wright designed dining room chairs were replaced with prairie styled chairs they acquired from the Yellowstone Canyon Hotel. According to Tamsen Emerson Hert in "Luxury in the Wilderness, Yellowstone’s Grand Canyon Hotel, 1911–1960", published in Yellowstone Science, Summer 2005, pages 21-35, "Quinn Blair and his wife Ruth, of Cody, Wyoming, have Canyon Hotel light fixtures adorning their Frank Lloyd Wright home (the only Wright building in Wyoming), as does the Holiday Inn in Cody. The Blairs also purchased a set of Limbert chairs from the president of the Yellowstone Park Company for $5 apiece at Mammoth Hot Springs." 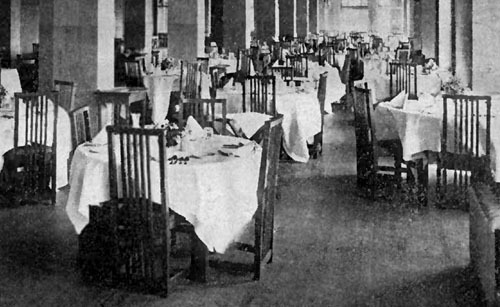 The chairs in the Blair's dining room are pictured in a photograph by F. J. Hayners in "A Miracle in Hotel Building. Yellowstone Canyon Hotel" by John Henry Raftery published circa 1911, page 14. 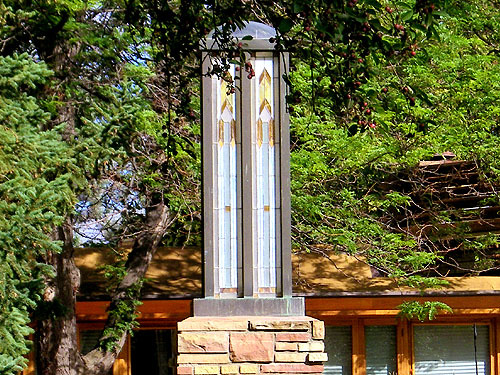 1: One of the double stained glass light fixtures from the demolished Yellowstone Canyon Hotel is mounted on a stone pedestal in the front yard. 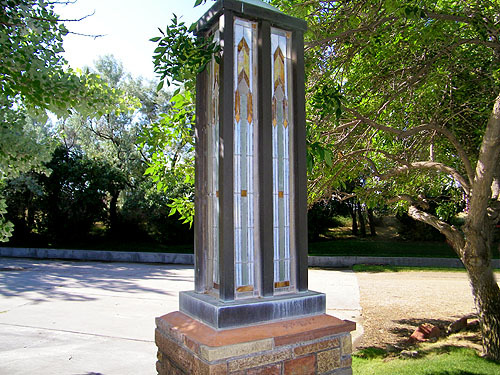 2: Detail of the double stained glass light fixtures from the demolished Yellowstone Canyon Hotel mounted on a stone pedestal in the front yard. 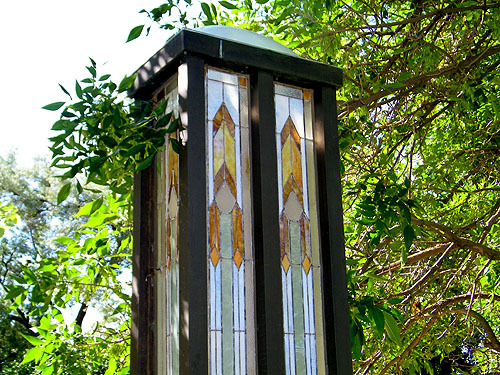 3: The second double stained glass light fixtures from the demolished Yellowstone Canyon Hotel is mounted on a stone pedestal in the Garden Court. 4: Detail of the double stained glass light fixtures from the demolished Yellowstone Canyon Hotel mounted on a stone pedestal in the Garden Court. 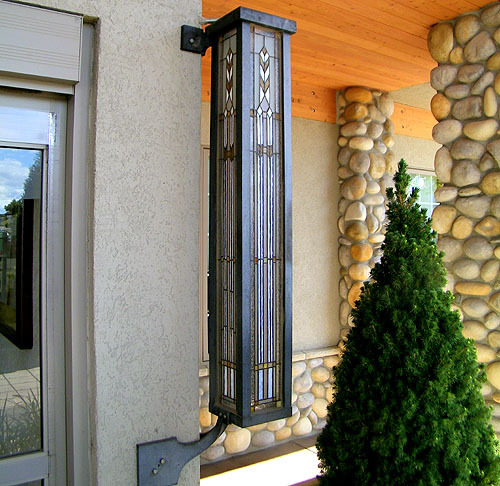 5: The smaller set of single stained glass wall mounted light fixtures from the demolished Yellowstone Canyon Hotel are mounted on either side of the entrance to the Blair’s Holiday Inn in Cody Wyoming. Yellowstone Canyon Hotel Postcard: "Grand Canyon Hotel, The Lounge and Staircase, Yellowstone Park." The double stained glass light fixtures are seen hanging from the ceiling. The single stained glass wall mounted light fixtures are seen mounted to each column on the left and right side of the lounge. 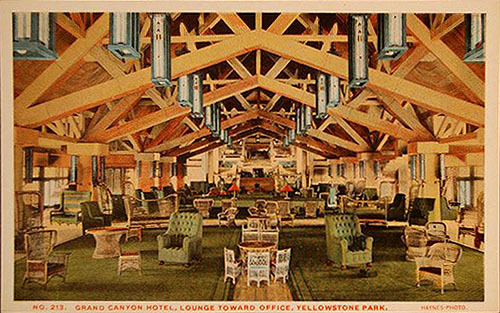 Yellowstone Canyon Hotel Postcard No.213: "Grand Canyon Hotel, The Lounge Toward Office, Yellowstone Park." The double stained glass light fixtures are seen hanging from the ceiling. The single stained glass wall mounted light fixtures can be seen mounted to each column on the left and right side of the lounge. 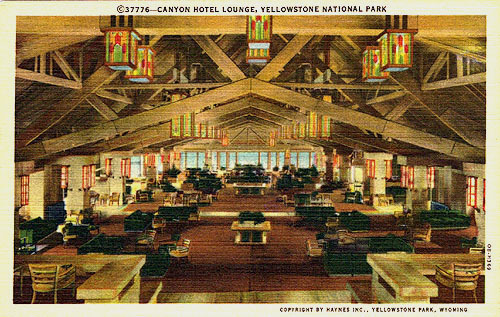 "Canyon Hotel Lounge, Yellowstone National Park (c) 37776. Copyright by Haynes Inc., Yellowstone Park, Wyoming. OB-H369." Back: "Canyon Hotel Lounge, one of the show places of the park, is the front wing of the hotel situated on the north side of the Grand Canyon. Copyright by Haynes Inc., Yellowstone Park, Wyoming, U.S.A. Genuine Curteich-Chicago "C.T. Art-Colortone" Post Card (Reg. U.S. Pat. Off.) [Place one cent stamp here]" 5.5 x 3.5. 1940. 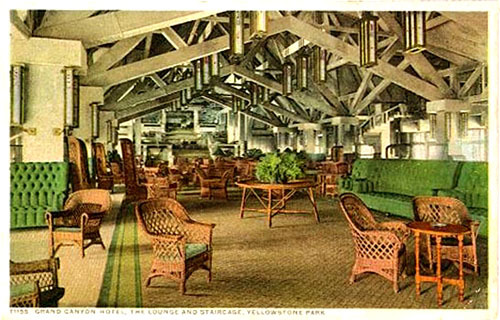 Yellowstone Canyon Hotel Lounge Circa 1920. The double stained glass light fixtures are seen hanging from the ceiling. The single stained glass wall mounted light fixtures can be seen mounted to each column on the left and right side of the lounge. 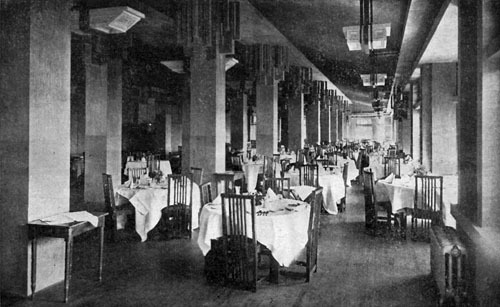 Yellowstone Canyon Hotel Dining Room Circa 1911. The Blair's Dining Room is seen in "Frank Lloyd Wright: The Western Work" Legler, 1999, page 62. This photograph by F. J. Hayners was published in "A Miracle in Hotel Building. 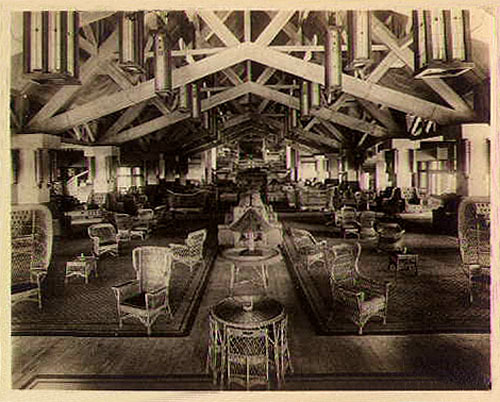 Yellowstone Canyon Hotel" by John Henry Raftery, circa 1911, page 14. Detail: Yellowstone Canyon Hotel Dining Room Circa 1911. 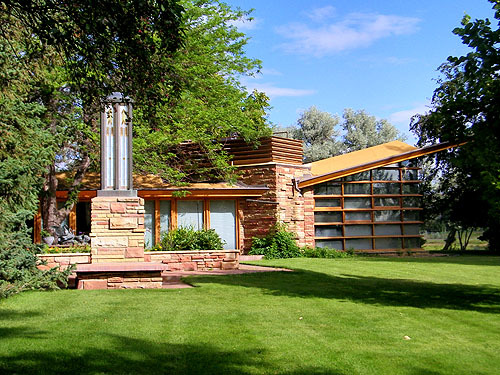 The Blair's Dining Room is seen in "Frank Lloyd Wright: The Western Work" Legler, 1999, page 62. This photograph by F. J. Hayners was published in "A Miracle in Hotel Building. Yellowstone Canyon Hotel" by John Henry Raftery, circa 1911, page 14.